Jelenleg az egyik legjobb és legnépszerűbb elektromos kávédaráló eszpresszóhoz! 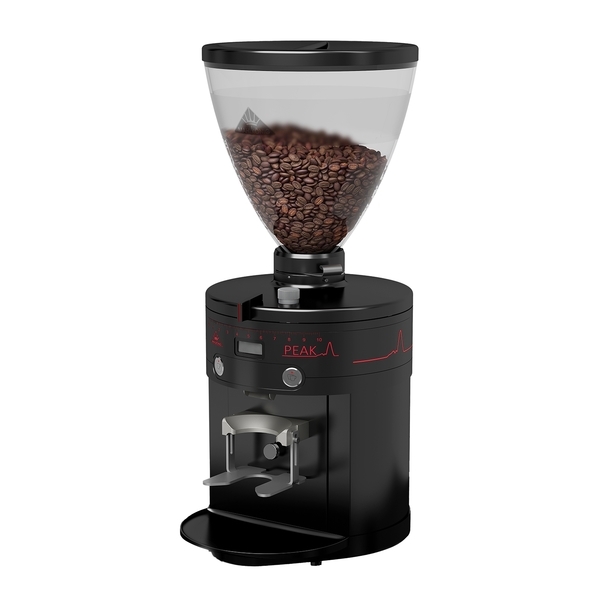 PEAK is the latest offer of Mahlkoenig - high-class electric grinder for grinding coffee for espresso. PEAK constitutes a combination of model K30 with a quality of grinding for espresso taken from EK 43. Cast steel grinding discs of 80 mm diameter in combination with low-speed motor (900 RPM) ensure stable and even grinding with capacity of approx. 2 - 3.5 grammes per second. Stepless grind adjustment allows setting this parameter really precisely. The coffee if ground directly to a port-a-filter, automatically when it is inserted; additionally, an outlet is illuminated. The problem of loosing coffee while grinding has been absolutely minimised. The colourful oled display makes setting a timer easier; it can be adjusted to 0.01 second in an easy way using 3 buttons. The temperature of the grinder is also displayed - it is cooled by using double ventilation.